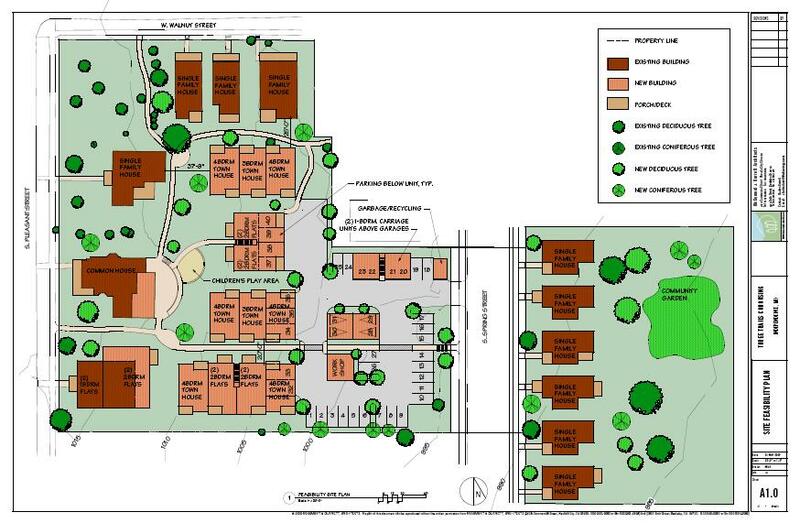 Three Trails CoHousing is an “infill” community in early planning stages, located in historic Independence, Missouri. A site 2.5 acre has been secured, adjacent to the old spring that wagon trains used to fill their water barrels before heading west on the Sante Fe, Oregon, and California Trails, and close to the historic downtown “Square” area. The site includes a Victorian red-brick home built in 1850, which was the site of at least one Civil War battle. Also adjacent to the site is a restored railroad depot, the Bingham-Waggoner historic home and museum, the Three Trails museum, a recreational complex, many impressive church buildings (church bells chime the hour), and the future site of a fesitival city park that will replace a “brownfield” manufacturing site. Four families interested in cohousing currently live in existing housing on the site. A 1900s vintage house will be remodeled as the common house, anchoring a “garden court” design with 20 to 30 residential dwellings, which will be a mixture of small single-family detached homes (existing) and attached townhomes and flats (new). The architecture will emulate historic Independence architectural classics. Existing housing units are currently available for rent. The current 1887 common house building is undergoing restoration work, with a larger kitchen and dining room to be added in the future. The project is sponsored by the InTERdependence CoHousing Association, which plans to empower six or more cohousing projects (both “Greenfield” and “infill”) in the greater Independence area over the next 10 years.